Learning to count with objects in nature can be such fun for kids. 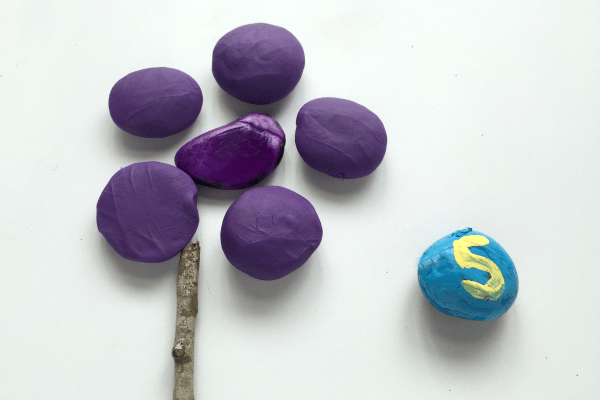 Create this hands-on math game with just a few items from around the house inspired by flowers. Kim Vij from The Educators’ Spin On It is sharing this flower math activity for our ABC’s and 123’s letter and math series. One main concept that we want our children to learn is how to recognize their numbers. Providing them with experiences that are hands-on fun with counting gives them a chance to learn while they play. 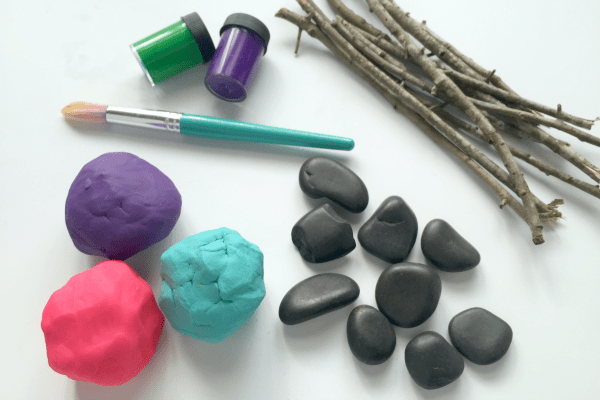 Adding playdough as one of the items used makes this a sensory experience your kids will love. 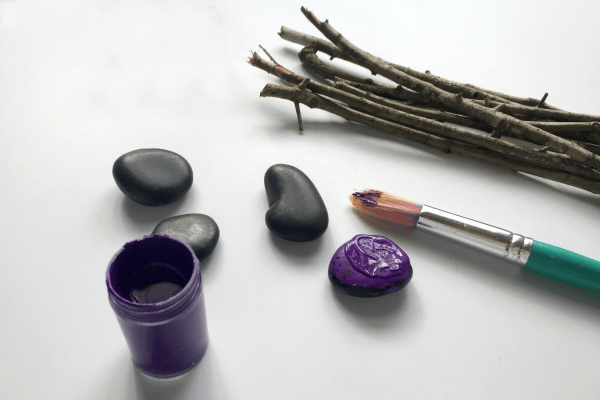 To create this learning game for your child you’ll need sticks, rocks, playdough, paint and a paint brush. 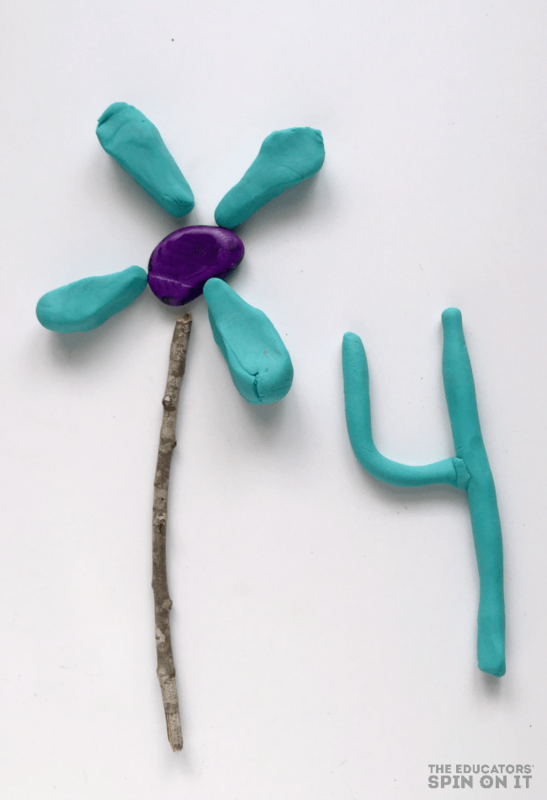 The directions for this playdough flower game with numbers are fun and easy for the kids to play and understand with just a little bit of guidance. Paint 10 of the rocks one color and allow to dry. Once dry use a different color to paint on numbers 1 to 10. Allow to dry. Paint 10 additional rocks a third color for the center of the flowers. You can use multiple colors if you want a more colorful math game for your child. Collect 10 sticks with your child from outside. Break them down so that they are all around the same size. 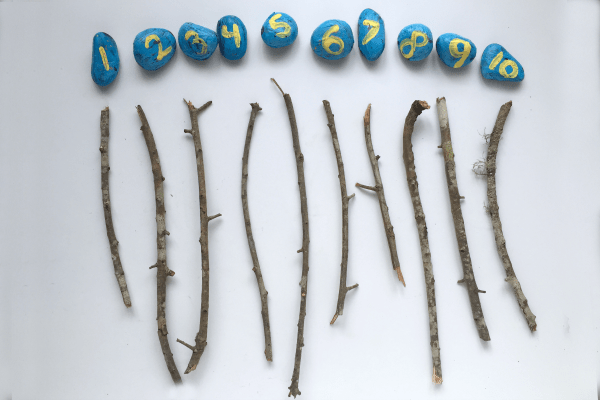 Once the paint is dry, line up the sticks and numbered rocks and discuss the numbers with your child. Encourage your child to line up the rocks from number 1 to 10. Then ask them to place the sticks down below each number counting one to one correspondence as they say the number out loud. Now it’s time to create your number flowers. 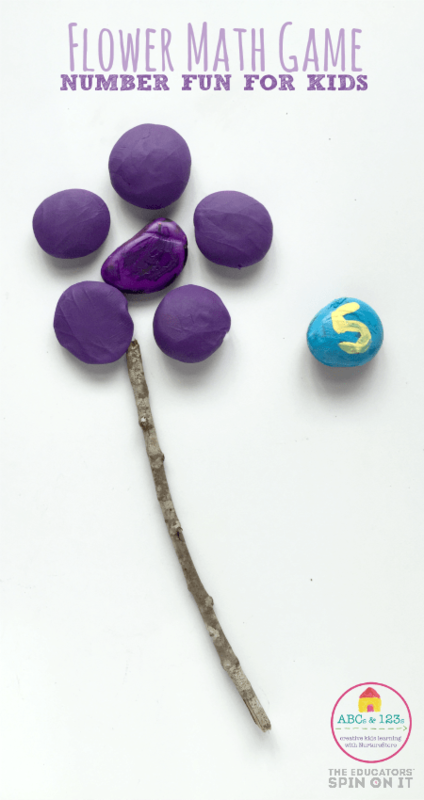 Select a number rock and a stick, and create flower petals to match the number on your chosen rock. Flower petals can be all sorts of shapes. Let your child get imaginative with their flower petal design. We choose simple round petals and tear drop shape. You can make prints and marks on top of your petals can make your flower even more complex and beautiful. For more Nature Themed Math Activities like this, check out this Spiral Paper Flowers Math Game , Seed Counting Printable and Number Scavenger Hunt and Number Book. Combining items in nature and play dough can be such fun and encourages our little ones to learn while they create! Kim Vij is a mom of 3 who blogs at The Educators’ Spin On It sharing ways to make everyday moments into learning opportunities. You can find more activities like this in her new book 100 Fun and Easy Learning Games for Kids, inspired by her 1.5 Million followers Pinterest. Do you have a young child who is learning their ABCs and 123s, and do you want to make their learning fun? Our ABCs and 123s resource of mulitsensory, play-based letter and math activities is just what you need.See more here.